If you haven't heard any of Jesse Young's music yet, the good news is that he drops in a little bit of flavor to fit many types of genre's. In just 4 songs you are going to be met with a lot of different sounds. He molds his music around the guitar but you will also hear a supporting cast of horns, piano, synthesizer, baselines, various percussion instruments and background vocals. For those reasons I have trouble making comparisons and categorizing his sound, but that's not to say you won't enjoy his high energy EP. As far as the lyrical message goes, Live Love Learn is a fitting title for this musical offering as the words describe some of the emotional ups and downs of a relationship. Music Sourced is a fan of Jesse's music because he has made it accessible to anyone who wants to listen and he's keeping his fans involved. This album was funded through the use of KickStarter and Jesse has offered his fans a lot of exclusive items for their support. He has also posted acoustic versions of his music, as well as a few artist covers on YouTube. On his site, he goes on to thank his production team for making his music shine, and states that this is his best recorded music yet. 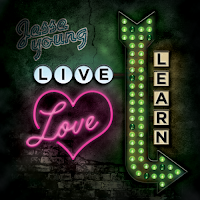 Check out what he's got at JesseYoungMusic.com. Oh and Jesse if you are reading this, I would personally like to know what some of your musical influences are and how that played a role in the sound you've created with Live Love Learn. I can practically copy and paste your list of "favorite music artists" as my own so you've got me wondering. Thanks for the great review and I'm glad you dug the EP so much. As for my musical influences they are pretty varied but I tend to credit Phil Collins, Ani DiFranco, James Taylor and Dave Matthews as big influences. Phil for his ability to write amazing pop songs, Ani and Dave for their acoustic style and James inspired me to pick up the acoustic in the first place. With this new record I don't know that I really had any one influence in mind when I was recording. I did use the new Maroon 5 record as a reference sometimes because I think the production on that album is incredible. I was just trying to make the best songs that I could and Zach, Derek and Fernando really helped take my initial ideas and make them even better than I could have imagined. But if I had to narrow it down to give you a straight answer, I'd say Every Step is a little inspired by Hall & Oates and Huey Lewis & the News, I love the big horn sections from those days. If You Go & Shattered have a little Gin Blossoms or Matchbox Twenty vibe to them and I don't really have one for Running. There was no difference in the approach to writing these songs than any other I've done, I was just lucky enough to work with some really talented people in the studio and the combination of all of us produced something I am very proud of. Awesome! Thanks for the detail Jesse. Huey Lewis & the News was the sound I was missing that I couldn't put my finger on. I guess my mind didn't wander back that far but that's a great influence to pull from because you are not hearing a lot of it right now. Dropping a triangle on the second chorus of "Running" is a great example of standing out with a different sound. That was probably my favorite part instrumentally. I agree, that was also one of my favorite pieces of production that Zach did, really added a nice vibe to that song.